Applus+ IDIADA, a provider of design, testing, engineering, and homologation services to the automotive industry worldwide, is working with the Port of Barcelona on an adaptation project that will see two of the Port’s straddle carriers converted to Liquefied Natural Gas (LNG) operation. Engine modifications are being completed and in-field testing is expected to be underway before year end. The APM container terminal at the Port of Barcelona is joined by APM BEST Terminal in the pioneering project which consists of the modification of the two straddle carrier diesel engines so that they can work with natural gas (dual-fuel engines or 100% gas engines) and the incorporation of the corresponding LNG tanks. This project includes the analysis of the needs and benefits of these machines; the technical feasibility of adapting straddle carriers; the design of the natural gas supply logistics in the machines and their security measures; the measurement and comparison of the consumptions and emissions generated by the different fuels; and the realization of specific training for personnel involved in the use and maintenance of straddle carriers driven by natural gas. At a meeting in February at the IDIADA facilities in Santa Oliva (Tarragona), the heads of the Department of Powertrain d’IDIADA explained how the transformation of diesel engines to LNG had been carried out, seeking more homogeneous and efficient combustion. Likewise, the design and adaptation of the 600 litre LNG tanks that will be installed in each of the straddle carriers was presented to the working group. Once the transformation of the engines has been completed, and once the installation of the LNG tanks has been carried out, the start of the tests is expected at the end of this year. This project, which began in 2016 and has a total budget of EUR 1.22 million (USD 1.51 m), is part of the CORE LNGas HIVE Project, led by ENAGAS and co-financed by the CEF program of the European Union and is also included in the actions envisaged in the Plan for the Improvement of Air Quality in the Port of Barcelona. The meeting was attended by representatives of Enagás, as coordinator of the CORE LNGas hive project; IDIADA, which performs the transformation of the engines; HAM, which is responsible for the installation of the deposits; of container terminals, APM Terminals and BEST; and the Port of Barcelona, ​​as leader of the initiative. Natural Gas Services, which is responsible for the study of LNG supply logistics, is also part of this project. Last week, at the Seatrade Cruise Global 2018 event, the Port of Barcelona set out its commitment to sustainability, the environment and innovation as strategic axes for the development of cruise activity. The Port is pushing forward concrete initiatives aimed at facilitating sustainable growth of the sector, both with environmental measures, included in its Air Quality Improvement Plan, and by promoting efficient management of cruise passenger mobility. The delegation from the Port of Barcelona pointed out that cruise operators are especially sensitive to environmental issues and to their own environmental footprint, so there are several areas in which port and shipping companies can work together. The Port is therefore making a firm commitment to using liquefied natural gas (LNG) as a clean fuel (it produces 85% fewer nitrogen oxide (NOx) emissions, 40% less CO2 and completely eliminates emissions of particulate matter and sulphur oxides). This strategy fits squarely with the environmental commitment shown by the industry, which has already announced or begun the construction of 13 cruise ships to run on this alternative fuel. Likewise, the Port is working to equip itself with all the necessary infrastructures and facilities for supplying LNG and is currently performing pilot projects to demonstrate and promote the viability of LNG as a fuel for mobility. 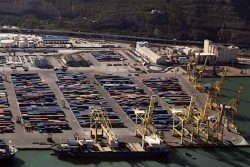 The Port of Barcelona in Spain has recorded the best results in its history during 2017 to become Europe’s fastest-growing port. A report by the port has found that the total cargo traffic surpassed 61 million tonnes for the first time last year, delivering a year-on-year increase of 26%. Container traffic contributed significantly to this result: nearly 3 million TEU was moved in 2017, representing an increase of 32.3%.